Samsung Galaxy Note 4 review | What Hi-Fi? Back in 2011, Samsung changed the shape of the mobile market with the launch of the original Galaxy Note. At 5.3in, it wasn’t the first device to push the boundaries between phone and tablet, but it was the first to really make us think of a hybrid as a possibility. And with that, the “phablet” market was born. Three years down the line, and the original Note now looks small in comparison. Devices now considered ‘normal sized’ are often pushing the 5.3in mark, and carrying around a big device isn’t as much of an issue as it was a few years ago. Bigger is getting better, it seems, and Samsung is most certainly leading the way – basking in the success of its Note range by launching its fourth iteration, the Galaxy Note 4. As ever, Samsung hasn’t done things by halves, and this has to be one of the highest-specced phones we’ve ever seen, packing more tech and features than you can shake a stylus at. The design of the Note 4 hasn’t changed drastically, but it has been refined. It’s near enough the same size body, give or take a few millimetres; Samsung instead worked on improving the look and feel of the device, and what goes inside it. It’s been largely successful. The edges of the Note 4 are now metal to give it a more premium feel in the hand, and the faux-leather plastic back panel from the Galaxy Note 3 has been tweaked to make it feel a little more subtle and grown up. If we have to work with plastic, we’d like to see it used in a similar way to that on the LG G3 rather than this textured finish, but it does help to make the Note 4 easier to grip, particularly for its size. We’d still take the premium aluminium design of the iPhone over the Note 4, but the ability to remove the back cover to boost its 32GB on-board storage and hot swap a battery is a good trade off that many will prefer. Samsung has put its ever-growing screen on hold for now, offering the same sized display as its predecessor at 5.7in. What has changed, though, is the resolution, making the jump up from full HD to a Quad HD Super AMOLED screen at 2,560 x 1,440 resolution, matching the display on the LG G3. We know there’s conflicting research on whether the human eye can see the difference between HD and Quad HD, but we’d argue that you would. As soon as you clap eyes on the Note 4’s screen, you notice a difference. It looks stunning and incredibly sharp, with Samsung’s vibrant colour palette and rich contrast immediately evident. This continues in video playback. The screen is seriously bright, so you’ll probably want to keep it down at around 50 per cent unless in direct sunlight (which the Note is great for), or use the ‘Adaptive Display’ setting that’ll tweak the display automatically to suit your environment. Samsung’s colour palette has cooled more recently, but it’s still on the warm side of the scale, with colours full of punch. It’s far from garish though, and the overall picture quality is really impressive, with stacks of fine detail to go at. The screen size is superb for watching movies on the go too, offering a much more immersive experience than on smaller handsets. The Note 4’s AMOLED display allows for the seriously deep blacks, though you will find a touch more shadow detail in something like the Xperia Z3 and better contrast too. It’s not bad here, but the whites don’t punch quite as brightly in darker scenes. Viewing angles are superb though, and motion is well handled too. There’s no doubt the Note 4 offers one of the best ways to watch video on the go. This is supported by a surprisingly good battery life. The Note 4 manages a hugely respectable 13 hours 42 minutes in our battery rundown test, looping a 720p video at half brightness with wi-fi switched on. This excellent performance is supported by both regular and ultra power saving modes for when you’re really caught out, and a fast charging feature that will take it from zero per cent to 50 per cent in just 30 minutes. 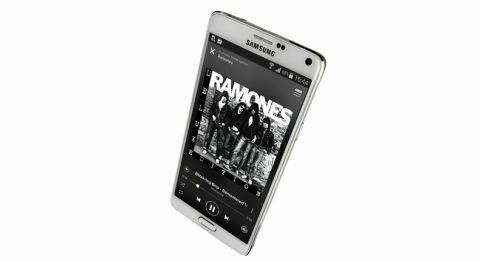 The audio performance on Samsung devices has been a bit hit and miss for us in recent years, but in the Note 4, it seems to be improving. Playback is enthusiastic with an admirable level of rhythm and drive. It’s well balanced and plenty detailed enough to keep us entertained. High-resolution music is also supported here, offering further insight and detail with tracks all the way up to 16 bit/192kHz. However, we find the Xperia Z3’s high-res prowess still provides the last word in subtle detail and refinement. While the smartphone market spent years trying to rid itself of the need for styluses, the Note range has always championed them; in the Note 4, the S-Pen is finally starting to make sense. It’s now twice as sensitive as previous iterations, so pressure, angle and speed all show up in your handwriting, and you can also use the S-Pen’s button in the same way as you would a mouse, to highlight passages of text to copy and paste. ‘Air Command’, which launches when the S-Pen is removed, has been tweaked and streamlined to include more useful options too. These include ‘Action Memo’ for taking quick notes, two quick selection tools for copy and pictures, and ‘Screen Write’, for the ability to write and draw on a screen grab. As far as the user experience goes, Samsung’s inimitable ‘Touchwiz’ is built over the most recent version of Android (Kitkat 4.4.4). If you haven’t used a Samsung device for a while, you might be surprised to see there is much less bloatware than before, with much of it now opt in by download. The Note 4’s interface comes with added tweaks to take full advantage of its larger screen, the biggest - and most useful - of which are the enhanced multi-window options. This gives you the ability to shrink apps down to smaller adjustable windows to allow for easier multi-tasking, and even shrink them down completely to floating circles on the screen (similar to those on Facebook Messenger, for example), which you can then tap to re-open whenever is convenient. There are also a few features from the Galaxy S5 that appear on the Note 4, namely the fingerprint scanner and heart-rate monitor that works alongside Samsung’s built-in ‘S Health’ app. With a device this size, this is almost definitely a two-handed job – trying to get a perfect swipe one-handed is pretty tricky to say the least. You’ll find the heart-rate monitor sitting just below the camera, which requires you to rest your finger on it to get a rating. This is also able to measure a few other things, like the oxygen in your blood and your stress levels, though how accurate these are, we can’t say. Any readings you take are stored in the ‘S Health’ app, which is a pretty comprehensive way to track your steps and exercise, log your food intake and weight and even store your sleep patterns with data from connected devices. You can use this as much or as little as you like – we made the most use out of the pedometer, which runs in the background using next-to-no-power and displays your daily step count on the lock screen. It’s quite addictive to see how far you’ve gone in a day, which we’ve no doubt is the intention. It'll even give you a nudge when you haven’t moved in a while to encourage you to stretch your legs from your office desk. The camera on the Note 4 has had a slight boost here from its predecessor - up from 13MP to 16MP - and packs Samsung’s new ‘Smart Optical Image Stabilisation’ to help keep things steady in the shakiest of conditions. There has also been some significant work done on its front-facing snapper, endowing it with 3.7MP and an f/1.9 lens for letting in 60 per cent more light than the Note 3. It’s also got a wider angle lens to allow for a viewing angle of 90 degrees, with the ability to push that up to 120 degrees with the wide angle selfie mode – basically a panorama mode that stitches a number of photos together after the fact. You can even use the heart-rate monitor to fire the front-facing camera too, which sits rather handily where you hold the phone. Built-in modes on the main camera are pretty sparing, with the nice option to download any others you’ll find useful so as not to clutter up the camera app with those you won’t. Manual options are still aplenty for those who like to tweak, and you can even place three of your most used settings on the main snapping screen for quicker access. The results are superb, and place the Galaxy Note 4 among the best smartphone cameras currently on the market. Colour reproduction is good, if slightly on the warm side, and there’s a strong handle on exposure and contrast, with a quick auto-focus. In good light, the Note 4 shines - capable of pin-sharp photos with great detail levels. Even tricky lighting situations are handled relatively well. When it comes to big-screened phones, Samsung really knows what works. It’s been doing it for years, before many of its competitors, and that really shows in the Samsung Galaxy Note 4. Innovative software tweaks that make the most of the screen, and a stylus that really makes sense now, sidle up next to one of the most impressive spec lists we’ve seen on a phone, all of which come together to make this a phone that more than justifies its size. Yes it’s big, but if you’re interested in it, you already know that. What you need to know is that it’s worth every single inch of your pocket space.